Actvity Summary: Imagine you are a scientist writing a proposal to use the JOIDES Resolution. Where would you drill? This activity guides students through the drill site selection process. This activity was written for School of Rock participants and assumes the learners have access to Leg 198 cores at the Gulf Coast Repository. The activity can, however, be useful in your setting through simple modifications and the use of online resources. 1. 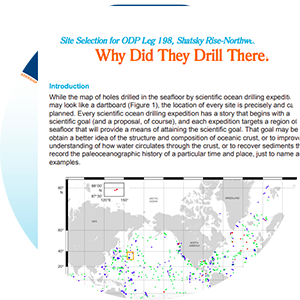 Students or student groups may choose any drill site from those indicated in the seismic reflection profiles for ODP Leg 198. Seismic lines can be viewed online or printed. 2. Instead of viewing the core lab, a selection of representative core photos can be viewed and downloaded from the expedition report. See Figures 12, 17, and 19.